Meghan Markle and Prince Harry landed in Dublin on Tuesday evening for a busy two days in Ireland. They are all set for their first foreign visit since their royal wedding in May. Well, maybe not all set. While Meghan radiated a sense of elegance in her emerald green Givenchy outfit as she walked out of the airplane, she seemed to have forgotten the one thing everyone does when they get a new handbag: take off all the plastic from it. 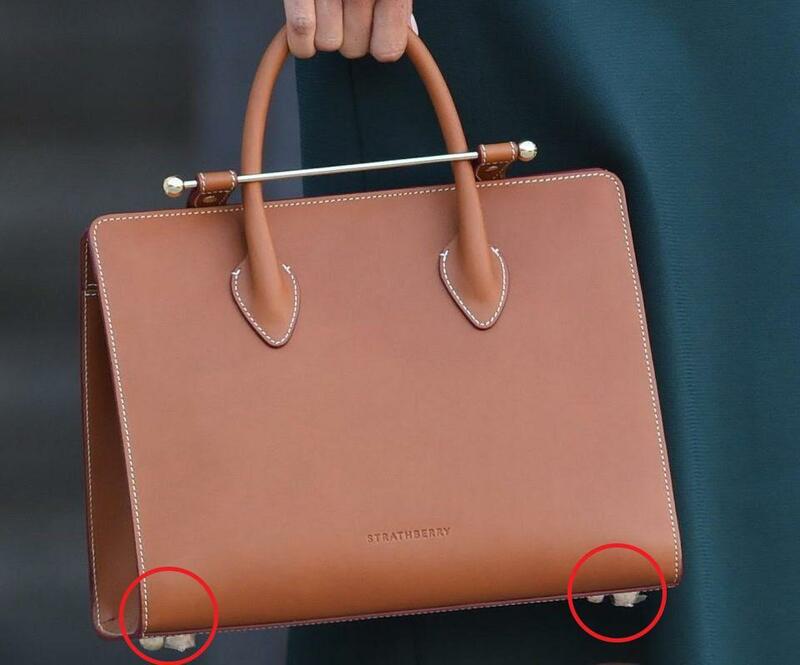 While her tan £475 Strathberry tote that features a Scottish designer's bar closure went really well with her attire, the plastic clumps sticking over the gold protective studs on the bottom of the tote looked rather odd. Meghan’s plastic mishap is not the only thing that has been at the root of internet trolls with regards to this foreign visit. The royal couple were immediately escorted to meet Taoiseach Leo Varadkar after they landed. While it seems like the couple were having an extremely interesting conversation with Leo, an image of the three talking surfaced on Twitter creating a source of entertainment for people all over the internet. In the picture, the three were seen engaging in conversation, sitting next to a table that held up no less than 14 bottles of water. One tweeted: "Harry and Meghan are lovely to bring all that water for Ireland after the hosepipe ban, hopefully, they brought some bread also." Another asked: "14 bottles of water? Thought there was a water shortage?" While another added, “Well none of them will go thirsty." One even joked saying, “I don’t know if they laid on enough water for Meghan and Harry in Leo’s office. Also, it looks very uncomfortable. Would they not invest in a couch? DFS probably have a sale on." 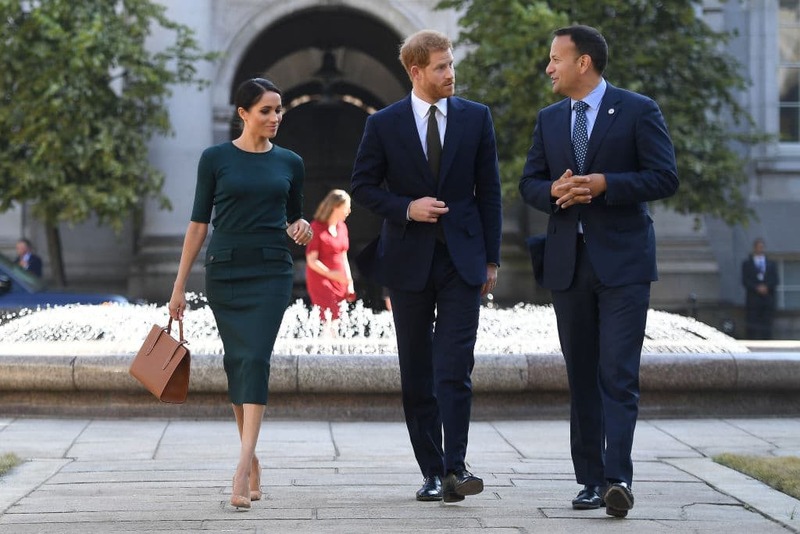 After their meeting with the Prime Minister, the royal couple headed to a garden party at the British Ambassadors to Ireland’s house at Glencairn in Sandyford. Meghan was seen wearing a sleeveless black dress by Emilia Wickstead. The full-length dress featured a belt and a square neck. Meghan also had her hair let down in its natural form with a side partition. He also made sure to thank Tánaiste Simon Coveney for hosting his father Prince Charles when he visited last month. He even joked about his father, saying, “It was also very nice to know that he didn’t bore you senseless.” He also revealed that both his father and his grandmother, Queen Elizabeth, have extremely fond memories of their time in Ireland. He too seemed extremely pleased about the fact that his first foreign visit as a married man is in fact in Ireland, calling it a “beautiful country.” Prince Harry also spoke about more serious matters such as the relationship between England and Ireland; he even threw in a couple of quotes by a former Irish President. On July 11 morning, the royal couple met the Irish President, his wife, and their adorable dogs Bród and Síoda. The couple was seen playing with the two fluffy beasts; Harry was even pictured disciplining one of them, reported The Irish Sun. After some fun time with two cuddle-worthy dogs, the royal couple accompanied the President and his wife to the Peace Bell, which was created to symbolize the 10th anniversary of the Belfast Agreement. The itinerary of the rest of the day involves a trip to Trinity College and the CHQ in the city center.